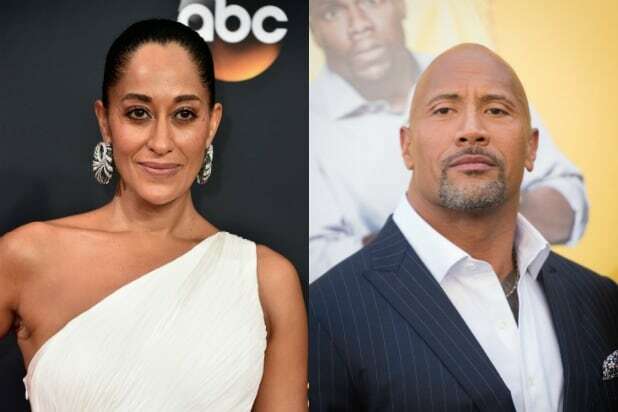 Tracee Ellis Ross participated in #FlashbackFriday, the social media hashtag for the day, and dug up an old photo of her and Dwayne “The Rock” Johnson. Also Read: How Much Would the 'Black-ish' VIP Disney World Vacation Cost? “#FBF to the one time I met The Rock early 2000s,” Ross captioned her post. Judging by the reaction of Ross’ followers, it seemed they wanted to see more of her and The Rock together. In fact, a few fans even suggested the duo would make a beautiful couple. “Hmmm, y’all woulda been kinda cute together,” commented one user. “Shoulda been bae,” wrote another. Others remarked at the similarities between the two actors. Johnson is currently on the set of “Jumanji” with Kevin Hart in Hawaii. The Rock will be playing the role of Dr. Smolder Bravestone alongside Hart, who will play Moose Finbarr. The film is expected to hit theaters July 28, 2017.